The martial arts have been around for thousands and thousands of years, guiding its practitioners in body, mind, and spirit. When demonstrated properly, modern day students embark on a life changing experience which makes them more focused people, confident athletes, more motivated goal setters, and better citizens. I, Master Rick Rando, have personally done thousands of school presentations, career days, seminars/programs, presentations, etc. in the public school system. In short, my presentations focus on respect for self and those is authority, discipline at home and at school, focus on tasks or schoolwork needing attention, politeness to family and classmates, and persistence or the ability to NEVER GIVE UP! I use humor and fun in my presentations and always approach presenting as a “re-enforcer,” supporting the faculty’s rules and guidelines. We are also set up to schedule and host school field trips to our state-of-the-art facility (please contact the studio for details regarding this service). My students become morally and physically strong-willed, and become positive role models and leaders for those around them. They learn how to overcome difficult personal challenges and learn the value of self confidence. At Kick Masters, we are Kickstarting Confident Leaders! 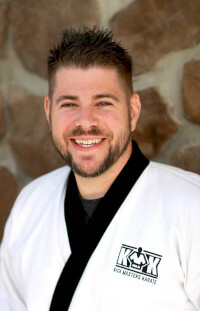 *To have Master Rick Rando attend and speak at your event, please visit his speaking website at www.randospeaks.com.